As a well-acclaimed Wholesale Suppliers, Importers and Traders of Tool Box in Maharashtra, we offer Tool Box consisting of 42 pieces of tools. Our Tool Box makes it easier for the user to find or carry all the tools at the same place without worrying of misplacing or forgetting any tool of importance. Some of the tools in our Tool Box include Hammers, Chizels, Tapes, Drills, Pipe Wrenches, Bench Vice & such other tools. 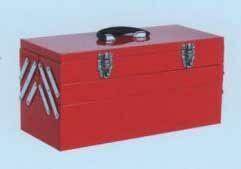 We also specialize in designing Tool Box according to the needs of the clients.